I lived for seven years in Germany. Before the wall came down. And I loved every minute of it. Loved the food. The People. The lovely landscapes. The castles. Loved their traditions, some of which I instituted as my own new family traditions. My heart warms seeing my daughter carry on those traditions. Some of them center around Christmas. We have an advent calendar that we hang at the same time the Christmas tree goes up at Thanksgiving. Each morning in December, the children wake up to see what small gift they have in the calendar—candy, money, pencils, etc. We have nutcracker ornaments we collected in Germany hanging from the tree. You know Krampus, right? The alternative to St. Nicklaus. Good children receive gifts from Santa. 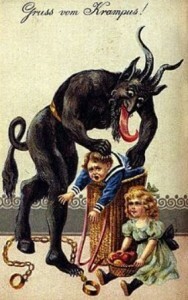 Bad children are carried away to Krampus’s cave where they are devoured. Germans can be a little scary in their storytelling. Just think of the real story of Cinderella where her sisters cut off their heels and toes to fit their feet into the slippers! One tradition I enforced on my children was that the moment they stopped believing in Santa, he stopped delivering Christmas presents. My children NEVER admitted that they no longer believed. My daughter’s been a little lax with that one. She let her oldest tell her she didn’t believe. I’d have taken all her presents and let her stew a day until she “re-believed.” But I’m mean that way. What traditions do you follow for your holiday celebrations, whichever one you celebrate? If you’d known about Krampus, would have you instituted him as part of your holiday tradition? Do you hide the Christmas pickle or the spider? This entry was posted on Tuesday, December 22nd, 2015 at 10:20 am in General. Tagged: Christmas. You can feed this entry. Both comments and pings are currently closed. If I did Krpus I wouldn’t institute it, pickle or spider. I do believe in Santa and the kids in our family do too. When I was little my parents would load us kids up and we would ride around the town looking at decorated homes…we loved it. We will all be at my mom’s for lunch and then opening gifts. By 3 pm I will be ready to come home and take a nap. Thanks for sharing! I’d have skipped the Krampus one. 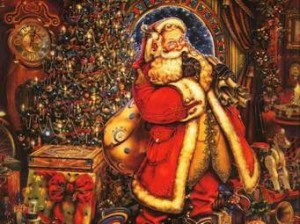 When my daughter asked if Santa was real, I asked if if she wanted him to be real. I said he wouldn’t come if she didn’t believe. She decided to believe. She was seven then, too young to lose that belief.